St. Francis of Assisi Middle School opened its doors to students for the first time in September 2003. Since then, the school and community have continued to grow. Students in Grade 6 and 9 from St. Francis of Assisi historically have done very well in achievement testing over the last few years. As well, the sports programs at St. Francis of Assisi have had great success and continue to improve each year. Some highlights include a number of junior volleyball and basketball titles and St. Francis is very well known as a badminton powerhouse. One of the most well known and popular stories of St. Francis of Assisi's life is the wolf of Gubbio. St. Francis was staying in the town of Gubbio where there existed a large and fierce wolf, whose hunger drove it to devour not only animals but humans as well. All in the town were in a state of terror and took weapons with them when having to leave for the countryside. Unfortunately, weapons were not enough for those who met this wolf and as such, the townspeople hardly ventured outside the town's gate. In response to all this, God had plans to bring the holiness of St. Francis to Gubbio. St. Francis had pity on the townspeople and decided to go out and meet the wolf, much to the objection and warnings of the people. St. Francis paid no heed to their warnings, trusting fully in the Lord Jesus Christ, the Master of all creatures, he ventured out to find the wolf. Some peasants accompanied him, but could not go very far as fear struck them. St. Francis ordered them to remain where they were, as he was going to where the wolf lived. Many in the town climbed onto places to witness this event. "...Brother Wolf, you have done great harm in this region, and you have committed horrible crimes by destroying God's creatures without any mercy. You have been destroying not only irrational animals, but you even have the more detestable brazenness to kill and devour human beings made in the image of God. You, therefore, deserve to be put to death just like the worst robber and murderer. Consequently, everyone is right in crying out against you and complaining, and this whole town is your enemy. But, Brother Wolf, I want to make peace between you and them, so that they will not be harmed by you anymore, and after they have forgiven you all your past crimes, neither men nor dogs will pursue you anymore." 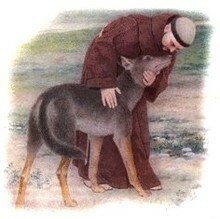 In obedience to St. Francis, the wolf moved its body, in such a way to demonstrate his acceptance of the Saint's words. Saint Francis assured the wolf that from now on, he would have the townspeople feed him every day so that he will never go hungry again, for it was out of hunger that Brother Wolf committed this terrible acts. In return, Brother Wolf was never to hurt any animal or human again. The wolf had agreed to all this and St. Francis asked for a pledge, in which the wolf gently laid its paw on the hand of St. Francis. Saint Francis had the wolf accompany him to the town to make peace with everyone, in the name of the Lord and the wolf began to immediately walk beside St. Francis. When the people saw this, they were amazed and word quickly spread that all were gathered in the central marketplace where St. Francis and the wolf were.